Finally! a place to go and talk about nerdy books that IAs love in safe, non-eyerolling company! 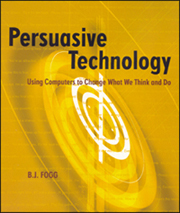 Yay to David Carruthers for kicking off the IA Bookclub which will meet for the first time in February to talk about BJ Fogg’s Persuasive Technology. I read this book in the first year I was doing my Masters when I first ever heard of captology, and it really changed the way that I thought about design. I’m looking forward to re-reading it and hearing what everyone’s got to say about it! (And to see how my reading of it has changed over the past few years). I’ll get onto it just as soon as I finish re-reading Inmates Are Running the Asylum. The first time I read that one was before the first dot com boom. The anecdotes and examples serve as massive flashbacks to that innocent time, but the guts of what Cooper has to say is just as inspiring as it ever was. Have you read it yet? It’s compulsary reading for anyone who’s anywhere *near* designing the way that people interact with technology. UPDATE: Book Club is SOLD OUT! I think there might be a waiting list, but apparently we have 17 IA Geeks getting together to talk next week. Excellent! twentysix are putting on some drinks and snacks, all you have to do is RSVP, read the book and come along! An IA bookclub?!?!? Where do I sign up? What a great idea – let us know how it goes. oooh Kirsten. What didn’t you like about Persuasive Technology?